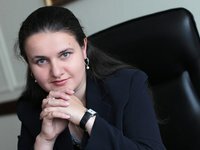 Acting Minister of Finance of Ukraine Oksana Markarova admits the fulfillment of the national budget for 2018 without cutting costs with the deficit being at the level of 2.4% of GDP. "We will definitely keep the deficit this year at this level, which we have now [the planned deficit of the national budget is 2.4% of GDP]. I hope we will cope without dramatic reductions in revenues and financing. We will smoothly fulfill the budget," she said in an interview with TSN. She also stressed the importance of returning to the three-year budget planning, noting that her main task is to implement an effective budget policy.